In an environment of lean teams and limited time, it’s important for marketers to analyze changes in Google’s search ranking factors every year to determine where to focus efforts. Callahan & Associates — the power behind CreditUnions.com — likes to look at the data behind everyday situations. Search rankings are no exception. Luckily, there is a lot of information available about key factors credit unions should pay attention to. Darren Shaw of local search optimization expert Whitespark publishes a yearly survey that breaks down each factor by importance. Based on insights from this survey, check out the two areas that increased the most from 2017 to 2018, and move them to the top of your 2019 “to tackle” list. Google My Business (GMB) signals account for a full 25% of where local businesses, including financial institutions, rank in online searches. A GMB listing is the credit union’s primary listing at Google, and the weight given to GMB signals was up 32.14% in 2018 versus 2017. Because of this change, credit unions should focus their efforts in 2019 on ensuring their Google listings are accurate and fully optimized with relevant categories and pictures. They should also take advantage of recent updates and additions to GMB, specifically Google Q&A and Google Posts. Google Q&A is tricky, as the whole idea is to allow consumers the ability to crowdsource answers to their pressing questions. It’s important for credit unions to monitor these posts and make sure the crowdsourced answers are accurate. Credit unions can and should participate in these conversations, but understand it takes effort to track and is about engaging the online community. Google posts are also picking up steam. These posts are a way for brands to share timely information on products, special offers, events, and announcements. Credit unions must act quickly to produce new posts because Google displays them for only seven days. The bottom line: Google wants to be a part of every business’s content strategy. Take advantage of GMB features and make sure to include Google My Business in the credit union’s 2019 social plan. If you read CreditUnions.com, you’ve heard us folks at Callahan say this time and again: Reviews matter! That rings true now more than ever. 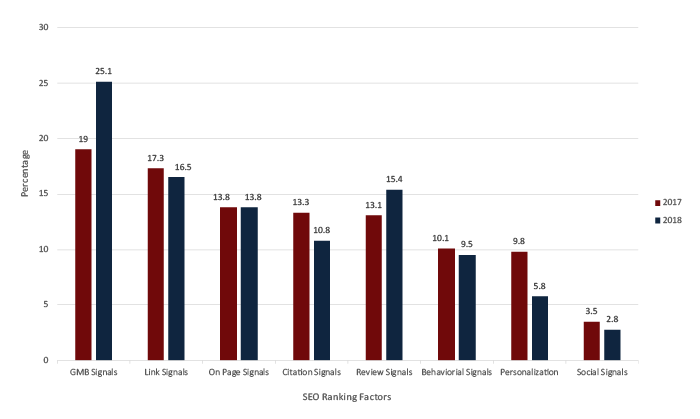 Review signals accounted for 10.8% of ranking importance in 2015. They jumped to more than 15% in 2018. These signals include several different review factors, including overall number of reviews, reviews by site, average star rating, response rate, and more. If your credit union doesn’t have a review management strategy, it needs to put one into place as soon as possible. (Need some help? Refer to the links above.) Reviews are often the first thing potential members see about the credit union, and they have a powerful influence over a consumer’s purchasing decision. But responding to reviews isn’t only a good practice for managing search rankings, it’s also a good practice for managing regulators. Anecdotally, several credit unions have said their regulators asked for documentation regarding social media review strategies and tracking plans during audits. Best to have a solid plan in place. 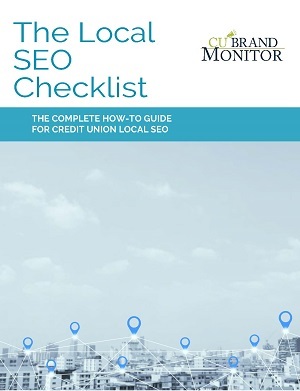 Need help jump-starting your credit union’s local SEO efforts or want to ensure you’re covering your bases? Download our free SEO checklist today.